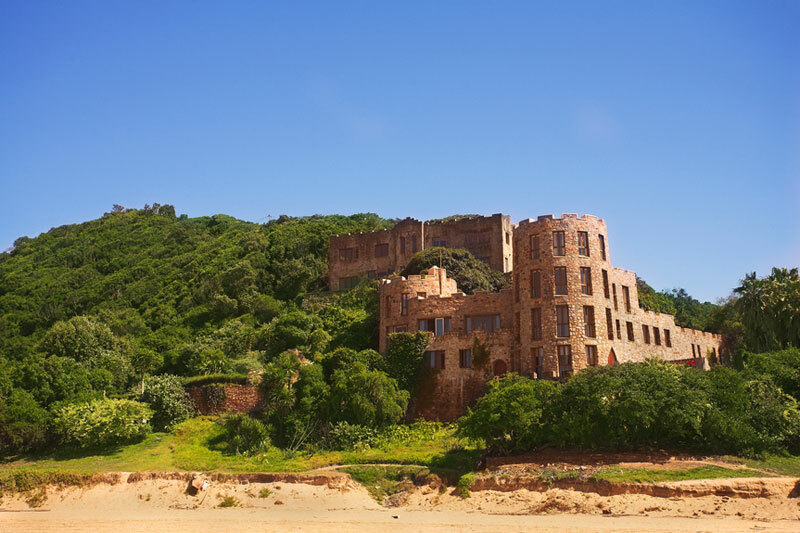 One doesn’t usually associate the raw and hugely varied natural beauty of South Africa with a fairy tale. That’s left to Europe to provide. But places in South Africa to visit, reminiscent of all things fairy, is not as ‘out there’ as you might think. 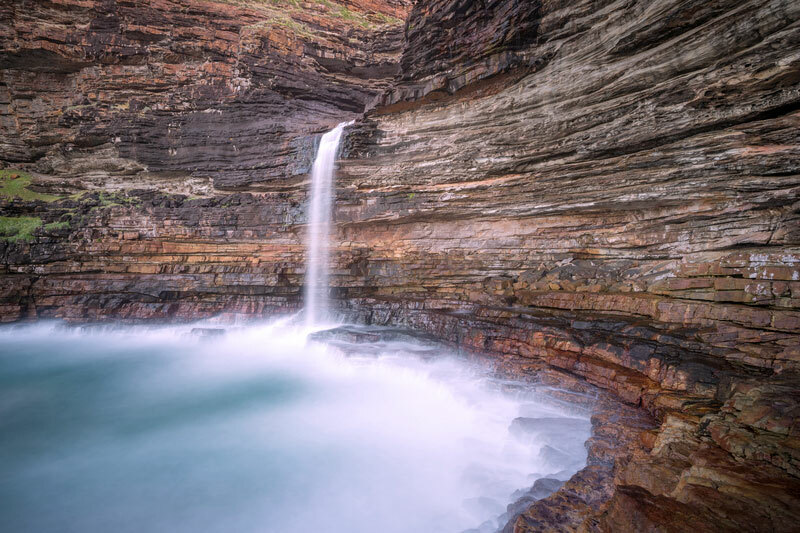 One of only 19 waterfalls world-wide to fall directly into the sea, Waterfall Bluff is a spectacular double-lipped waterfall on the Wild Coast of South Africa reminiscent of another world. You’ll find this magnificent fall between Port St Johns and Mkambathi Nature Reserve, but it’s not as simple as merely driving there. One apparently can reach it only as part of a hike (although, if you stay at Mkambathi the falls are easier to access). The exciting part of these near-vertical cliffs, just south of the Msikaba River, is that hikers can get right up close and personal with the waterfall, and even behind the falls. Also on the Wild Coast is a magnificent coastal rock formation that looks like a bridge across forever. Or, at least, an entrance into another realm. The Hole in the Wall is on the beach at Coffee Bay. The towering offshore, detached cliff has through its centre a giant opening, carved over years by wave action. It doesn’t seem to matter how you approach the mythically proportioned edifice, it photographs beautifully from above, the side, or directly in front of it. In the right season, and at high tide, the waves clap the opening in such a way that you can hear the thwack for miles around. The little secret beach of Noetzie was once known as Noetziekamma, or place of dark water. Today it’s a protected cove known by few not even ten minutes’ from the popular Garden Route town of Knysna. And it’s a fairy kingdom of not one, but three castles. They’re admittedly nothing like the great European castles of times gone by, but seen in a gentle light, they hold an uncomplicated beauty that relies almost entirely on the grace of their surrounds and renders a fairytale quality for visitors and residents alike. Noetzie’s beach is accessed along a gravel road, followed by a steep climb down a narrow path and cliffside steps. Head down Tulbagh’s Church Street at dusk, accompanied by the eerie call of peacocks, and the romance of the Dutch gables, thatched roofs and sloping, lush lawns rich with late afternoon shadows and the glitter of waning sunlight as it filters through the leaves of the trees, and you cannot fail to be enthralled. The town’s backdrop of the Winterhoek, Witzenberg and Obiqua Mountains, and the gurgling of the Klip River down at the bottom of the narrow properties’ gardens, makes this one of the most whimsical places in South Africa to visit at sundown. 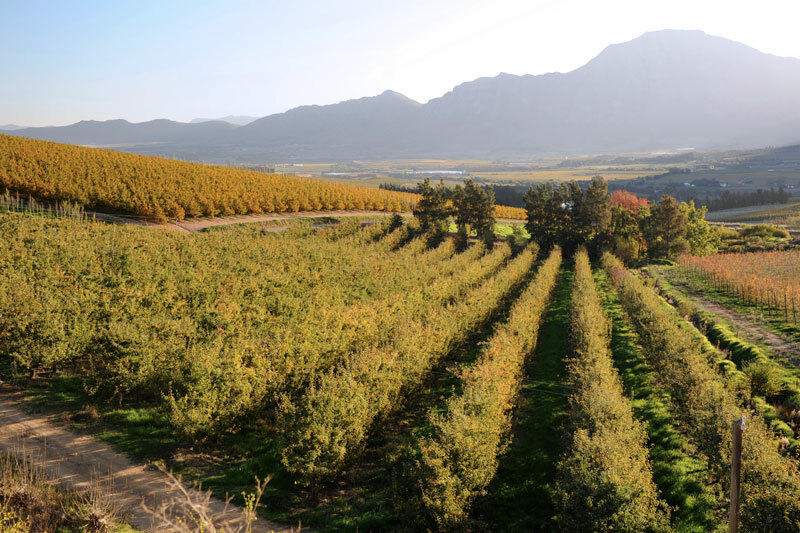 Why not stay in Tulbagh overnight? 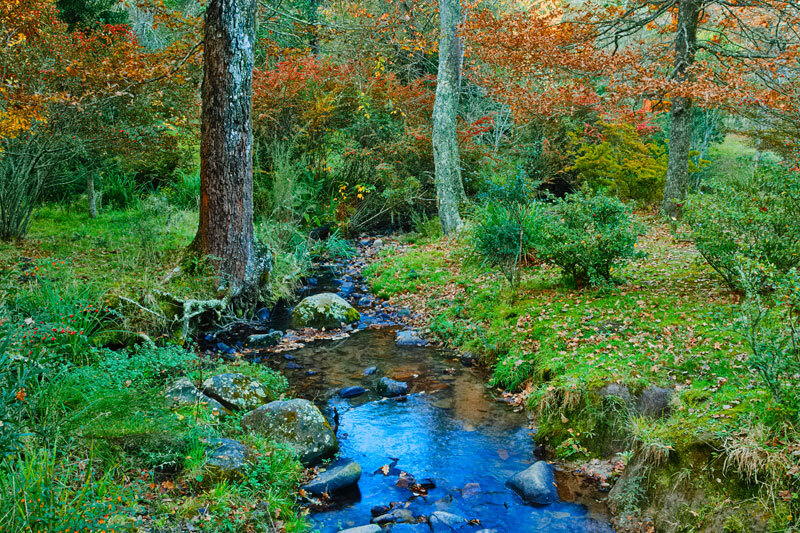 The term ‘away with the faeries’ was created with Hogsback in mind. This wee town in amongst the Amatola Mountains is South Africa’s Middle Earth, its forests the realm of Rivendell and elves, its largely dirt roads effortless paths to nowhere. The lush forests and the little town combine to form a misty-morninged oasis up on an escarpment rich with yellowwoods, white stinkwoods and other indigenous plants and ferns. Numerous walks through the forest lead to various waterfalls close to town, and a trail network takes you through forest undisturbed and richly characterful. 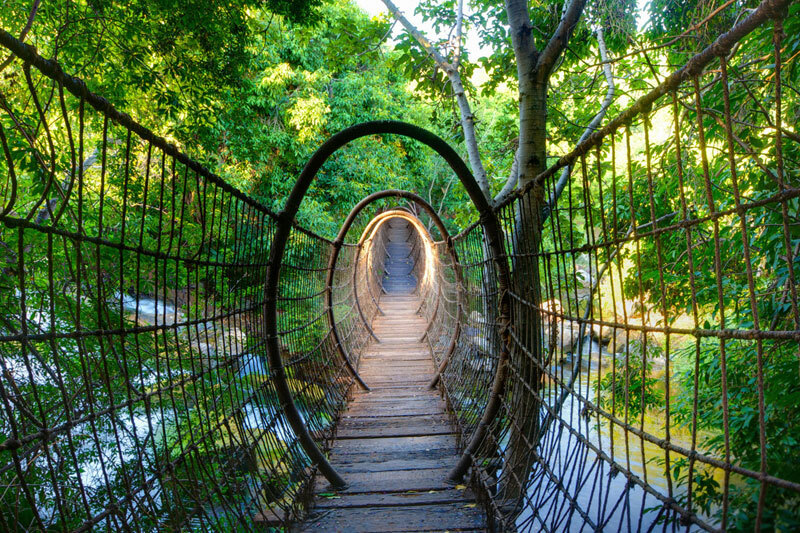 Not only is Spider Bridge in Sun City one of the most unique and creative bridges in the world (and much photographed and shared on social media, as a result), it’s also thoroughly otherworldly, its oval-shaped rope corridor like an avenue, or passageway, into the fairy realm. The gothic proportions of the red sandstone of the Cederberg is a destination of its own near Clanwilliam, roughly 300 km from Cape Town. To reach these sometimes haunting rocks one must drive past groves of gnarled orange trees and a sea of rooibos to the mountain range named for the endangered Clanwilliam cedar tree. The strange arch of the Wolfberg is a hike away (contact Dwarsrivier), but you might stumble upon the rare snow protea found nowhere else in the world but here en route. Sleep under the stars at the arch before making your way back into civilisation once more. 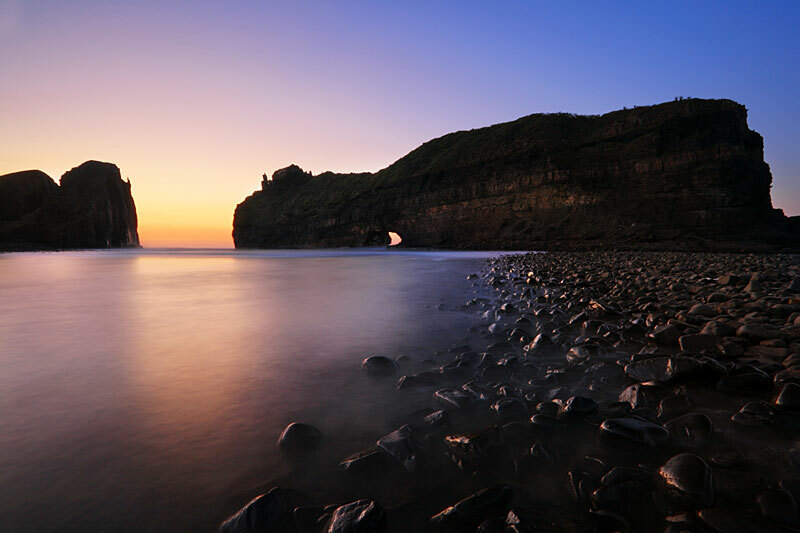 Best photograph moments: sunset and evening, and try and include the Maltese Cross (another rock formation) whilst in the area.